With it practically a given now that on your next flight you’ll have to pay to check a bag, you may take a shot at flying with only a carry-on bag and not checking any luggage at all. More and more people are doing so, and there entire websites, such as www.onebag.com, devoted to the art of traveling with only a single carry-on bag. Many people choose to try this with rolling luggage, but as discussed in another article, Luggage or Backpack?, there are some clear advantages to traveling with a backpack – and the advantages are even greater when going the carry-on route. First, the additional hardware used in rolling luggage takes up valuable packing space and also makes the bag heavier. This means you’ll have a harder time keeping it under the carry-on size and weight limits which vary amongst airlines (see The International Maximum Carry-On Size and Weight Limits). Second, because rolling luggage tends to have a hard structure to it, if your bag is larger than what the airline accepts, you won’t be able to squeeze it down to a size that fits the luggage templates and you’ll be forced to pay for a checked bag. A backpack, on the other hand, is soft and can easily conform to the size of the luggage template – even if it means pulling out a sweater. Carry-on backpacks are also about half the weight of rolling luggage, meaning you’ll be less likely to have to worry about weight limits, which can be as low as 5kg or 11lbs on some airlines. If you decide to go the way of the carry-on backpack, here are some choices to consider. The TLS Mother Lode Convertible from eBags is a solid choice with an excellent price. It weighs in around 3 lbs 11 oz (not including shoulder and waist strap) with dimensions of 22″ x 14″ x 9″. It’s standard carrying capacity is 3299 cubic inches, and this can actually be increased to 3651 cubic inches by fully unzipping a zipper to expand the bag (hence “convertible”). When expanded it’s almost certainly over the carry-on limit, but this is still a useful option for before and after your flight, e.g. packing away your long sleeve jacket once you’ve arrived in a tropical destination. The bag features a padded laptop compartment, a feature often lacking on other carry-on backpacks. Other stand-out features include a removable hip belt (not padded, unfortunately), a fold-down “shelf” to give you the option to divide the inside of the bag into an upper and lower section (which helps with organization), internal and external compression straps, and several exterior pockets for organization. All in all, a very well thought out bag for carry-on travel that is definitely worth checking out – especially given it’s reasonable price. I’ve personally traveled with this bag for several months, and I felt totally confident in the workmanship. That said, it’s reassuring to know that the bag is also backed by a lifetime warranty. It’s also available in a range of colors if black isn’t your preference. 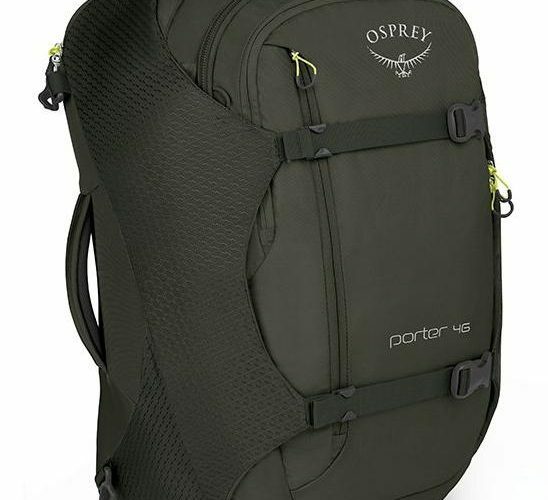 Osprey has a great reputation for making backpacks that last. 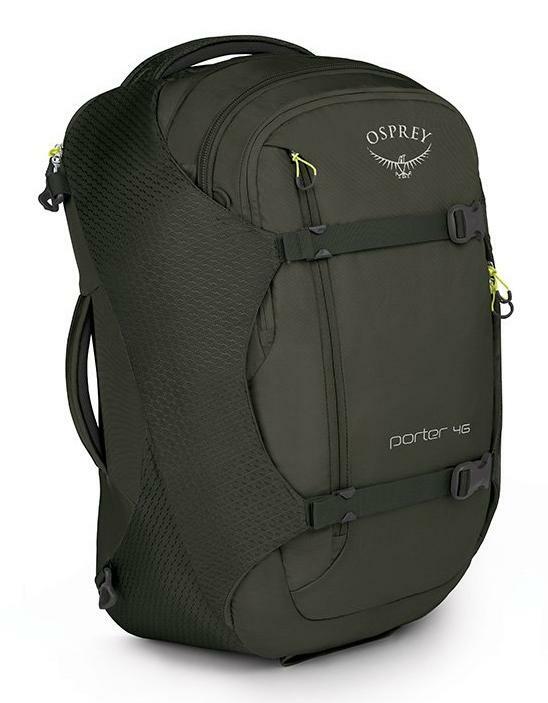 With 2,800 cubic inches of space, the Osprey Porter 46 has the highest capacity of all the bags listed here – and at a mere weight of 3 lbs 6 oz. There’s a padded laptop pocket on the back, a front panel organizational compartment for small items, a zippered top pocket for liquids, a vertical front pocket for a book or documents, and two internal organization pockets. 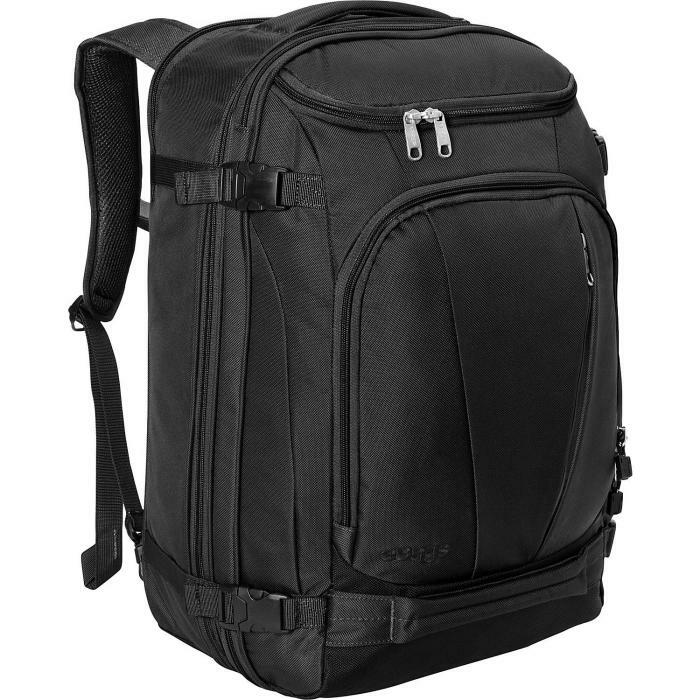 A significant difference between this and the eBags pack is the padded hip belt, which makes this backpack a better choice if you think you’ll be doing any extended walking with it. You can pull the two compression straps to keep the bag size down, although I’m guessing that if you pack this bag to the limit, it’s very likely you’ll exceed the allowed dimensions of some airlines, and could run into trouble – especially on the airlines with smaller carry-on size restrictions outside the U.S. If you’ve found a backpack that works great as a carry-on, share your find by leaving a comment below. If you’re up for it, pull out your ruler and include the dimensions! I want to use a convertible carry-on bag. My challenge is that I want a slightly smaller bag than the legal size bag. I’m 5’1″ & 95lbs. I want a convertible carry-on that offers compartments for organization yet lightweight and durable. The bag, when full must fit under the seats as I cannot reach the overhead compartments. The weight must be evenly distributed, I do travel light as I use public transportation. Any suggestions would be appreciated. I’ve been very pleased with the L.L. Bean Expedition Travel Pack. It’s more of a duffle with straps than a backpack. 22 x 14 x 9.25″, 2 lbs. 5 oz. Big main compartment and several smaller ones. Tuck-away shoulder straps. Padded back. Sturdy carry handles. I’ve taken it between Vermont, California and Iceland. I’d like to use it again, but my son is using it between Calif., Boston, and eastern Europe. I may have to get another one. My only carry-on difficulty was on a commuter jet with 2+1 seating, and the flight attendant gave me a stern look as I jammed it under the seat.